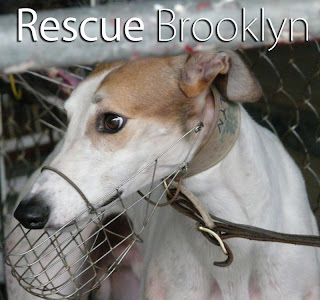 According to the Macau government, Brooklyn the greyhound is still alive. Brooklyn is a four-year-old red, white and fawn greyhound who was born in Australia. He has spent the last several years at the Canidrome dog track in Macau, a deeply troubled facility where all greyhounds eventually die. GREY2K USA Board member Charmaine Settle took Brooklyn's photograph when she inspected the Canidrome in October 2011. Since then his story has been reported by newspapers across the world, and he has become the face of a global campaign to help all of the Macau greyhounds. More than eight months have passed since Brooklyn last raced, and with each passing day we have become increasingly concerned. On May 5, 2012 he apparently fell during a race, was injured and finished sixth. According to a translation of the tracks' website, his "hind leg" was "cut wounded on web." Six days later, an update was posted which stated that his injury had been "cured." "Seven months have now passed since Brooklyn was reportedly 'cured' of his injury, yet he has never raced again. Sadly, we fear he may no longer be alive." "Please be notified that Brooklyn, which is now under the ownership of Macau (Yat Yuen) Canidrome Co. Ltd., is still in recess after his injury had been cured." "During the past few months, we found that the IACM has already been discussing and co-operating with Macau Canidrome and Macau's Society for the Protection of Animals (ANIMA). Also, they are now still in the process studying and arranging the adoption program for the dogs retired." "As being compliance with our competences and obligations, and respecting the willingness of the owner of Brooklyn, we should continue to pay close attention on the development of this issue." We are relieved to hear that Brooklyn is apparently still alive. At the same time, there is much more work that needs to be done to help the Canidrome dogs. Please visit RescueBrooklyn.org today, and lend your voice to this important fight. I know that together, we can bring about change at this terrible track.